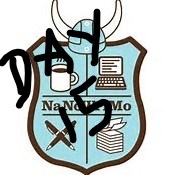 Here we are at Day 15 of NaNoWriMo, the halfway point. With a little help from pieces of my story I’m jumping around with, I was able to reach (and go beyond) my 5,000 word goal today. I did more than 7,000 words! So, now my word count is at 27,536. And, of course, the word goal for today was a total of 25,000 words (if you’re keeping track out there). By the title of my blog today, you can see where I’m going. 🙂 Yes, laughter. It can be an important thing in your novel, even if it’s horror or drama. When I read Heinlein’s “Battlefield Earth”, I was surprised to find quite a bit of humor in his writing. It endeared me to both the author and the characters. As the evening wore on and shops closed, I decided my search would have to go to a different place; that of a tavern. I had passed one likely suspect in my wanderings, called “The Drunken Wench”. It was also not far from where I currently was – another reason it was a good a place as any to start. It was late evening when i arrived, but not so late that patrons were still not coming and going from the tavern. There was a smell of roasted wild boar and vegetables along with honey mead wafting out from the door when it opened and closed. Above the door, the tavern’s sign swung in the light breeze portraying its transgressed wench. So I put to you…create an amusing scene, even it it’s just a small bit such as the one above. Make someone laugh. Use your inner comedian and smile a little. Heck even the bad guys have to laugh too. Have a good evening and a good tomorrow. Keep those pens and computer keyboards going.